LG G6 phone has a 5.7-inch screen with 18:9 aspect ratio | What Hi-Fi? The G6 has a Quad HD, 'FullVision' display at an 18:9 aspect ratio, which will accompany its built-in Quad DAC. Most films are made in the 16:9 aspect ratio, which has been the standard since around the start of the 1990s. But that's not enough for LG as its new smartphone, the G6, will be coming to users with a whopping 18:9 aspect ratio, 5.7-inch display. 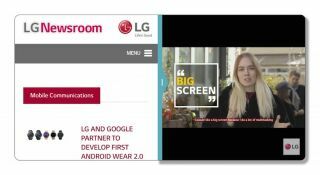 LG says that an expanded screen allows users to view more information when surfing the web, reading eBooks or watching videos. However, if you're worried that your normal 16:9 video content will look stretched on the screen, don't be - the G6 software promises to let you "view existing 16:9 ratio content easily" in the new ratio. This smartphone will have a QHD+ (Quad High Definition) FullVision display, which equates to a 2880 x 1440 resolution - large enough that it "almost entirely fills the front of the smartphone". LG is also changing its user interface, allowing the screen to split so two apps can be viewed side-by-side. Alongside the built-in Quad DAC for the "best sound", it looks like the company is taking steps towards ensuring its new smartphone delivers when it comes to audio and video. Expect all the new products to be revealed at Mobile World Congress (MWC) 2017, which takes place at the end of the month.